It is July - hard to believe. I am back after inadvertently stepping away from blogging for some weeks. It has been extremely busy but in a good way. Today I am excited to have Mari from Arcadian Home with some stunning inspiration for using color in your home any way you choose. A white living room goes pink with matching armchairs and bold galactic artwork. The design is a beautiful mix of color and metallics. All the paneling and woodwork in this stylish dining room has been painted in a stunning blue. The light from a modern pendant light, floor lamp and wall sconces is reflected beautifully by the glossy walls. Color on the ceiling? It works well in this chic guest room. Taupe paint on one wall gives more depth to the space and looks beautiful with the ceiling color. Wow! What a great use of primary colors. Alternating vivid hues on the steps in this white entryway gives the space a happy vibe. Here, a solid blue wall is used as a background for the focal point of the room, a large contemporary painting. It works beautifully, don't you think? This contemporary dining room is filled with color in varying applications of orange. One wall of solid color, one that reads white with its delicate orange vine pattern, chairs with orange on the outside and white inside, orange shaggy area rug on the gray floor—it's variety that works here. Even the modern pendant lights above the table are an intense orange hue. An all-white living room is brought to life with a rainbow of colorful accessories. Whether you like a little color or a lot, this idea of white walls, ceiling, floor and upholstered pieces works because you control the amount and the intensity of color. This white bathroom is fun, not overwhelmed by bright color above the bead board and inside the cubbies behind the freestanding black tub. Images 1 | 2 | 3 | 4 | 5 | 6 | 7 | 8 What do you think of these inspirational rooms? Leave us your thoughts below and be sure to stop by for more home decor and pendant lighting ideas! Thank you, Mari! This post shows us that color can really go anywhere. As Mari points out, you are in control. Whatever your point of view, the amount of color - intensity, combinations, just a splash - can be decided by you. I love the multicolored, whimsical steps. 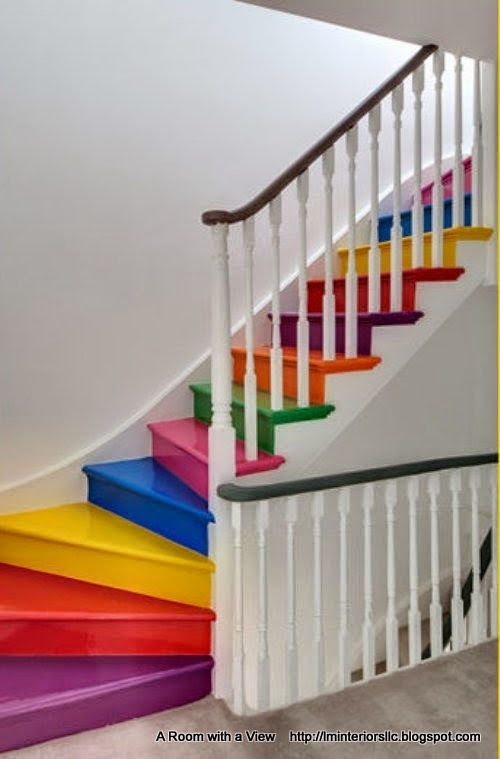 They would be perfect leading to a kids' playroom in a basement or attic. I would love to do a room with a colored ceiling in my own home some day. Isn't the cobalt blue wood paneled room incredibly dramatic? Which picture is your favorite?